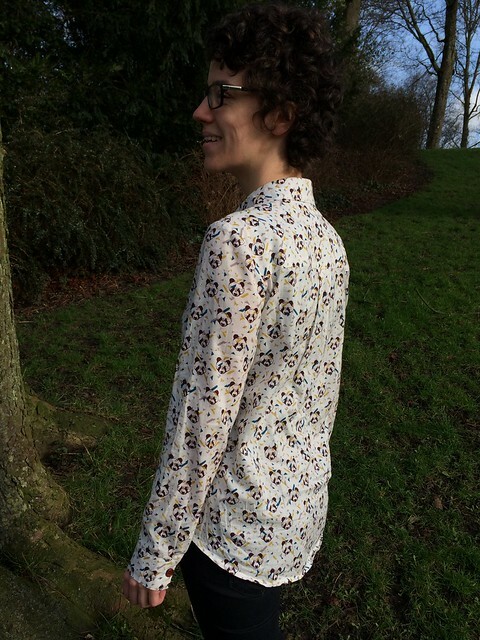 One of my main sewing missions for 2016 is finding the perfect button-up sewing pattern, and although this one is not that yet, it is pretty good! I love the straight silhouette, and the fact that it has no darts whatsoever. The fit throughout the body is great, but I do wish the sleeves were just a tad shorter and tighter, especially around the wrist. Those crinkles you see throughout the body are a combination of the shirt having been in my bag for a few hours, and the fact that it was very windy! The process from fabric to shirt was rather slow. 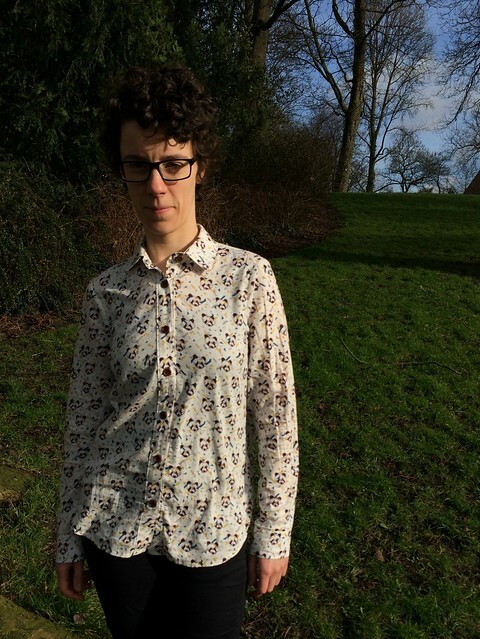 From October 2014 to July 2015, the fabric was waiting for the perfect pattern, and from July 2015 until last week this shirt was in a box, completely finished except for the buttonholes and buttons. I had been putting off the buttonholes for months because my machine isn’t always the best at them. Last week I had a sudden burst of finishing energy (at 11pm, of all times) and I am very glad I finally got it over with, because I’ve been wearing this shirt a lot since it’s been finished! 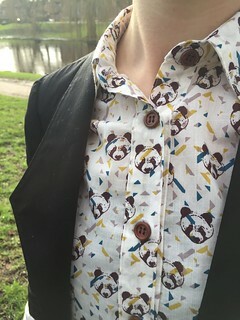 The original design has a pointed yoke and patch pockets, but I decided to not include those because I was too lazy to create perfectly matched panda-pockets. Perhaps there is another version in the future that will include those details, because they do look very cool. Also, yes that is indeed a Morris Blazer in the second picture. I don’t often have a chance to take photos, so we decided to get that one photographed too. It does however deserve its own blog post, so that one will come later this week! Great shirt! Loving the pandas. Such a great fit for no darts, too! Thanks! I was also pleasantly surprised by the fit.